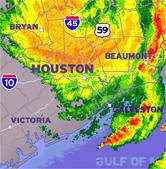 Brother Jesse Blog: Hurricane Ike Update~ALMOST EVERYONE WITHOUT POWER! Hurricane Ike Update~ALMOST EVERYONE WITHOUT POWER! Hurricane Ike swept through Houston and has left its mark. Houston Mayor White held a press conference this morning to warn residents to stay off of the streets as streets teams work to clear debris...and to even stay away from water pumps due to potential contamination! Be careful. Drink Bottled Water if you have it stored or boil your water from the faucet if necessary. Newswires reported that CenterPoint Energy said about 90 percent of its roughly 2 million customers were in the dark before daybreak even as the storm continued to 80 mph winds with the eye 35 miles southwest of Lufkin at 10 a.m. That means nearly 4.5 million residents were without power and doesn't include the service area of Entergy Texas. Entergy spokesman David Caplan said 96 percent of its customers throughout its service area — or 380,000 - are in the dark. Many residents who decided not to leave the Galveston area were in dire need of assistance because of the storm surge of Ike. Disasterous pictures are all over the Internet and many people are emailing me their personal images of damages to their home. Below are images sent to me from a resident in Missouri City, Texas after Ike's touch hit their subdivision. **LEAVE ME A COMMENT ABOUT YOUR EXPERIENCE***Send me your pics to jesse.muhammad@gmail.com.